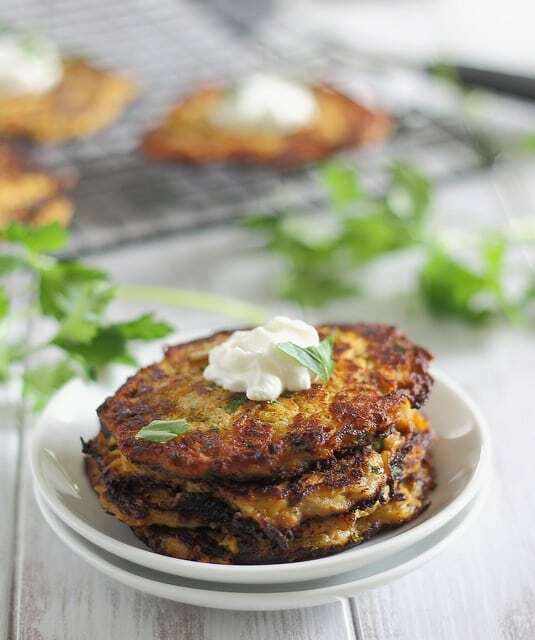 These spaghetti squash latkes are spiced up with a little jalapeno and made a bit healthier with squash instead of potatoes. Once upon a time I told you about my dad’s crazy “grew up in India but wasn’t Indian, mom from Italy in a family circus and dad from who knows where” background. Crazy right? Well, it gets even better. He was also raised Jewish by a pretty orthodox (from what I hear) grandfather, practiced until he left India at 18, then came to the states, met my mom and somehow they both not only convinced a priest to marry them in a Catholic church, but also allow my dad to take communion during the ceremony. That’s like complete blasphemy now in 2012, so in 1979 it was even crazier. He eventually converted to Catholicism when I was in 5th grade and I very vividly remember sitting through that Easter vigil 3 hour mass for his ceremony. To a 9 year old it was the closet thing to physical torture that existed. So he’s part Indian, but not really. Part Jewish, but not any more. And part Italian, part who the hell knows what else. And yet with all that confusion as to religion and descent, we never even had a damn latke in my house once growing up. The closest we got to any traditional Jewish food was a stale box of matzo in the pantry that really does nothing as far as bolstering the reputation of Jewish food. What’s up with that, dad? So for a girl who can’t even spell menorah without having to look it up or even begin to tell you the meaning behind it (I’m sure I learned it in ccd, but had we actually gotten graded in there, I probably would’ve come out with about a 23 as an average grade, religion just isn’t my thing), I’m pretty proud of these latkes. They’re not traditional at all using spaghetti squash instead of potatoes, but that’s mainly because consuming an entire spaghetti squash by yourself goes a lot slower than you anticipated (and are used to when there’s normally 2 people in a household) and push was coming to shove with the shelf life remaining in that tupperware container. So I figured since tradition was already bucked, why not throw in some jalapenos to buck it up even more. Crispy outsides with a hint of spice, perfect with some tart yogurt or apples on top depending on your mood. Maybe I could just pretend to be Jewish for the food? In a medium skillet over medium heat, saute the onion and jalapeno with the 1/2 tablespoon coconut oil until softened, about 3 minutes. In the meantime, combine the squash, egg, almond meal and parsley in a large bowl. Once onion & jalapeno mixture is done, add it to the large bowl with the squash and mix together. Using the same skillet over medium-high heat, add enough coconut oil for pan frying (about 2 tablespoons). Spoon about 2-3 tablespoons of the squash mixture into the skillet and fry until brown and crispy (about 3-4 minutes) on the bottom, flip and cook on the other side until crispy. Carefully transfer latke onto a paper towel lined cooling rack. Garnish with extra parsley and serve with yogurt, sour cream or apples. Dam, I made spaghetti squash last night and I threw the rest out, however it tasted kind of bitter! I think I let it sit on the counter a tad to long!!! I love the idea of swapping out the potatoes and using squash!! I like all the ingredients especially the kick of heat with the jalapeno. I will have to give this a try! Faaaaantastic. 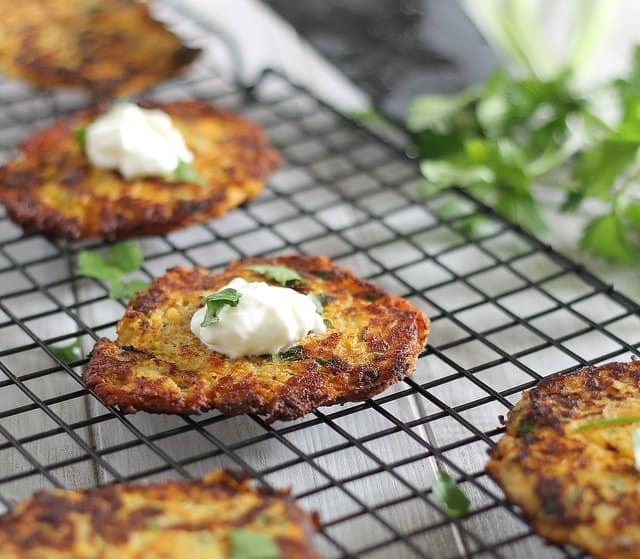 I love latkes, but I like the thought of using spaghetti squash instead, even more! That’s crazy about your dad’s background! See, things are easy for me. Mom is Indian. Dad is Indian. Boom. Now, if REB and I have kids, that will be fun :) RECIPE FOR KIDS. …. I seriously LOVE latkes. So much. And you are a genius, have I said that? I would love to have a nutritionist put out the nutritional facts for Gina’s recipes. As a diabetic CHF patient, low carb and low sodium are Paramount. Of course I can figure it out through the recipe, but having the facts would be so handy. These look so good. I have a spaghetti squash just sitting in the kitchen. I’m so glad I found your blog and look forward to following! Gina! I love this post 1000%. I’ve been secretly buying up a quarter of all the NYC spaghetti squash and stuffing my face with it to no end – must try this! I’ve never had a latke, but this looks like a tasty introduction to them! just pinned! as these latkes look fantastic!! Wow, your dad wins for most interesting background :) Yes, the least he could have done was share some latkes with you, which are pretty much Jewish soul food! Love this version! This is a seriously awesome idea! Yum! 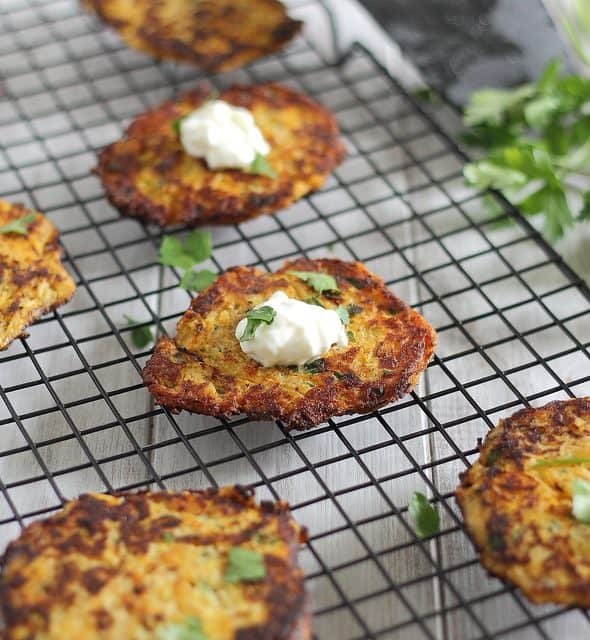 I love latkes(at least the way I make them which probably isn’t the way everyone else makes them…) but the idea of putting squash in them.. genius! Just tried this recipe! It came out fantastic. I added a little bit of nutmeg and added some red pepper flakes even though there was jalapeno. I love the combination of flavors. Truly a great recipe! Thank you! Pingback: 20 Healthy New Takes On Traditional Latkes - Freshwadda Brooks | Coming Soon! Wow, I definitely just pasted the WRONG text. What I meant to say was, I love your paleo recipes but I dont understand how you prepared the squash. Can you help sista out and elaborate on the prep process? I made this with banana peppers instead of jalapenos and oh my god they are so good. Everyone in my family loves them. As the only one in my family who is vegetarian, I’m always on the lookout for good recipes to try to pull them from the dark side (haha). I love spaghetti squash and this is just perfect!